Previously in the Architecture Practice. After struggling from different angles to get the practice to take off, the new chief architect Herbert Birchbranch (called Herb in the text) landed in a mantra where Quality dedicated to output from change processes is the way to drive the discussion about what architecture to define and how it should be structured. ArQiteQture was the headline (read more). During the months before Christmas, Herb started to ask questions and stress the discussion about quality and quality measures. It took a two weeks and then he realized that the thing Quality wasn’t that obvious as he thought. The only quality measures that he caught in the discussions was about how well the projects follow the project model. Nothing about the result at all. Hm, down in the cellar again, Herb thought. What shall I do? I can’t start the probably long process to officially establish quality measures. He realized that this is a public organisation with other cultures and measures that he was used to. After some thinking a question that went into Herbs mind was; do I have anything stable for the architecture practice to lean on? He then realized that the Project process model and the Project Office, even though they are contained in the IT organisation is the far most best. The newly implemented model for system management could also be good a platform, but it is new and built around an annual process cycle, which they couldn’t wait for. So, back to the project process and the last versions of the architecture working model, Herb thought. We will need some basic principles to lean on when continuing the work. Suddenly Michael Hammer came into his mind. 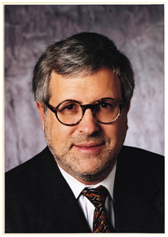 Dr Michael Hammer was one of the world’s foremost business thinkers. He is the originator of both reengineering and the process enterprise, ideas that have transformed the modern business world. In 2001 he published the book “the Agenda – What Every Business Must Do to Dominate the Decade”, with two purposes in mind: first, to offer business people guidelines on how to survive in an economy where customers have the upper hand, and secondly, to give people, whether or not they are business managers themselves, a sense of the real business news – the exciting changes occurring in the business world, largely out of the public eye. Herb read the book a few years ago, and had ever since thought that the principles could be applied to any modern enterprise architecture practice, where focus is rather on business than IT. Take some time and think about each principle. Try to imagine how they can make sense for an architecture practice. How Herb apply the principles will be presented integrated in the story of this and later blog posts. One of the first things Herb built in the architecture practice was a model for architecture interaction with the project process and the project office. The model hasn’t been implemented due to the fact that it was un-clear what architecture to build and use in the procedures. Make it happen! Put Processes first! Let’s start, let’s focus on the project process and add architecture procedures. The first model we created looked like this. The red areas represent the project playground for the Architecture Team. In the Strategic Dialogue the architects bring in the current architecture into a business dialogue, as well as they seize needs for architecture. Prepare for a future you cannot predict! Simply, just create the architecture that is needed. The Strategic Dialogue is a mechanism to be prepared for a known future and not be harnessed in a too predicted future. The seized needs are stored in the Architecture Portfolio, from which architecture needs are grouped and prioritized, and dispatched to the Architecture Development process. Another prescribed output from the strategic dialogue is SD, a document with Strategic Directives specifically for the project, based on the established Architecture Principles. 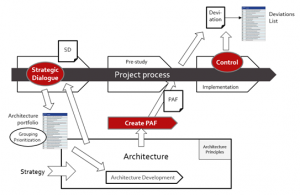 Create Project Architecture Framework (PAF) is a complementary pre-study phase for the project where all adequate architecture for the project is put together and explained. In this procedure deviations from the architecture can be established and catalogued in the Deviations List, a communication of strategy and architecture deviations to the management. Run your practice for your key stakeholders! Through the process for creation of PAF, the architects have a capability to adapt to the key stakeholders situation. For example, if an urgency appear the architects can give a go for a solution that deviates from the architecture. Create order where chaos reigns! The Control procedure is a governance mechanism which can be ordered by the management or project office to apply control on selected projects which seem not to take the architecture seriously, where chaos reigns. The Control is performed based on the Project Architecture Framework, PAF. Deviations from PAF are logged in the Deviations List. Just before Christmas Herb was invited to the extended management team to present and discuss the architecture practice. He had heard that the members of this team, the middle management, don’t understand or see the value of architecture. So, he was prepared to meet resistance and lack of understanding. Everything turned in the opposite direction though. Something like a hallelujah moment occurred. There was a total common understanding of the architecture value and a complete unified will to implement the architecture working model (as described above). They all wished each other merry holidays and left for Christmas with a smile. After the holidays Herb suddenly got a meeting invitation from Laura, the manager of the IT Project Office. She wanted him to meet the new project office manager Ronald. He accepted the invitation, without reading the details. Extend your context! It is important for the architects to take all opportunities to meet new people, to learn more about the business, to create acceptance for architecture and to build networks. The meeting with the project office members turned out to be smash hit. Laura and Ronald actually represented the newly instituted Business Project Office. After presentation and discussions about the current project and architecture working model, the model got revised according to the project office reality and plans. Among many things it became clear that the projects become visible in the IT portfolio just before the pre-study phase and that the early phase where the architects wanted to run their strategic dialogue didn’t exist. Ronald anyway said that they have to implement an early business dialogue as a part of the business project establishment process. As he doesn’t have any architects in his organisation, it will be a task for Herbs architecture team. Extend your context! Suddenly a blueprint for a natural bridge between IT and Business had been founded, and the architecture team will play a key role if they are ready to take on the challenge. It was also obvious that another cross-organizational structure had been defined; the essence of the Hammer principle: Manage without structure! If you as Herb strive to build an architecture practice that makes a difference, try to apply Michael Hammer’s principles. What does the new architecture model look like? Will Herb and his team manage to kick-start the architecture procedures? What else is waiting around the corner? The story continues..